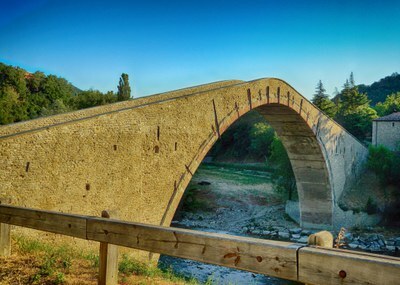 Crossing Santerno river since more than five hundred years, a real masterpiece of civil engineering, the Bridge has a structure with a single arch of 42 meters. Commissioned by Obizzo Alidosi in1499 to Andrea Gurrieri for five hundred gold ducats, the bridge symbolizes the power and the strength of the family. The construction lasted more than twenty years, favoring Castel del Rio as a country trade area. Inside, five rooms, probably made for structural reasons. National monument since 1897, the rooms of the bridge have inspired many artists, and particularly the imagination of Roberto Raviola - Magnus, the famous cartoonist, who set his comics in these charming and mysterious places.